Rubs and spices are so great. They can be much better for treating foods than simply dumping sauces on them. A few days ago the wife and I powered up the barbie (that’s BBQ in Australia) and chose Todd’s Dirt as the treatment of choice for our meals. She chose a salmon kabob while I made a top sirloin steak. I’m not a fish eater so I didn’t try the salmon. 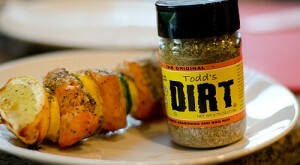 The wife loved the flavor after grilling it with Todd’s Dirt as a rub. My steak was excellent. Loved the flavor and how it didn’t overpower the steak but added to it. I’ll be using the rest of my Todd’s Dirt very soon, as in tonight.